I am participating in the ATHGO Innovation forum, hosted at the World Bank in DC from August 13-15. This short series is an account of what occurred; of reflections and takeaways. My first full day in DC begins with the usual stroll past the IMF, and down the (apparently) famed Pennsylvania Avenue towards World Bank HQ. Queue security; check ID; “Step right through”, and we’re finally inside. Today’s opening panel on team building and networking is quite lively. John Shegerian of Electronic Recyclers International is moderating, with Ivo Ivanovski (Minister of Information Society, Macedonia), William Saito (Intecur), and Navneet Singh Narula (nBrilliance) as panellists. “Everyone should have 500-1000 dollars in the stock market, if for no other reason to understand your own emotional response to risk” and thus be better prepared to handle a situation when significant risks are on the table. 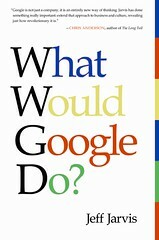 – Jeff Jarvis, from his excellent book What Would Google Do? (p. 112, 113) This quotation is unfair to the purpose of the book, as the above statement is a mere subset of the overarching theme regarding the paradigm shift in marketing thought we are undergoing largely as a result of the internet and social media. Highly recommended reading.